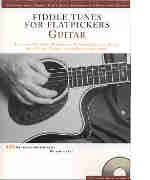 Flatpicking Guitar Songs Book by Bert Casey shows the secrets of playing bluegrass lead guitar. Includes exciting, accurate arrangements to popular songs and is written in both tablature and standard music notation. There are 29 breaks for 12 songs, and each break is played both slow and fast on the CD.